All winter long we have had to buy water. We have not yet put in a cistern and it is too cold to put your hand into the stream to fill jugs. It is still pretty cold and there is no way to get the car down to the stream yet, but we are sick of buying water. Until the cistern gets put together, we need something else. The Man went out wandering the property in hopes of finding some water flow closer to the house where we could collect water. He managed to find a tiny spot where the water flowed over rocks in such a way that he could get a gallon jug under the flow and catch it very nicely. He managed to clean the area enough to get the trickle to pick up a just a little bit. It takes about ten minutes for the jug to fill, but you don’t have to sit there and hold it the whole time. He wanders that area while the jugs fill, cleaning up the brush and branches that are in his path. It’s starting to look pretty good down there. The site of this water is just beyond the site of the new house, which will be great once we move down there, many years from now. It isn’t too far a walk, and carrying four water jugs at a time, it doesn’t take much longer than it would to go down to the stream. Plus, you can just sit and enjoy the quiet while the jugs fill, if you want to. Here is last years failed attempt at rainwater collecting. Chop, chop, chop. All winter long. Chop, chop chop. Not that I personally chopped a single piece of wood, but it seems like we spent the entire winter chopping firewood. I know that we were only unprepared because we were busy building a house, but it was really annoying to not have a solid supply of heat. Not to mention how little fun it is to try and lug wood around in a winter coat, gloves, and scarf. I did lug a ton of wood this winter. We are going to more than prepared this year. We have already started wandering around the property, gathering wood that can be used for fire wood. There are quite a few downed trees around the lot that were left by the logger. I have been moving all the logs out of the way of my many projects and into large piles where they can begin to dry out. Right now, the logs are in tangled messes coated in mud and buried in leaves. The cleanup process is quite a bit of tedious work, but there is at least a whole years worth of firewood that is easily accessible. As I sort through the piles of random logs that are tossed around the lot, I am also finding quite a bit of building material. I can use the scrap wood for my outdoor kitchen, my outdoor shower, my garden fences, and a playhouse for the kids to name a few. We shouldn’t need to cut any trees down, and will still have more than enough to keep us warm and to finish my many projects. I also have a nice pile of wood that is less than perfect that will make for excellent outdoor fire pit fires. One of my favorite things to do on a cool,clear night is to sit around a fire and just enjoy the stars, the fire, and maybe even a beer. We are going to have to have a few fires outside this year. An important project that will come out of all of this is a wood storage shed. Here is the spot, right behind the chopping block. I know I haven’t posted much lately,but I have been working on it. I am learning some new tools to help me be a better blogger and to make my writing more interesting. I have plenty of posts coming up in the near future as there is a lot going on here right now. I hope you enjoy! After almost two years of cold sandwiches, eggs, and hot dogs, we have finally started real cooking on the wood stove! While rushing around and working all day, simple “meals” like peanut butter and jelly were acceptable because we were just too busy and too dirty to prepare a grand meal. Since we aren’t rushing madly to get a roof over head or hauling firewood so that we don’t freeze, we can actually start to eat like real people. We are learning to prepare healthy, hearty meals on the wood stove in the dutch oven. It is pretty much too late for this, since it’s spring and we are using the wood stove less and less, but we will be all set for next year. Today’s meal was chicken vegetable soup, nothing too fantastic, but it’s not a hot dog. I prefer one pot meals where I can chop everything, toss it in the dutch oven, and wait for the fantastic aroma to fill my tiny house. The method we used can be applied to any combination of ingredients your taste buds are begging for. I chopped all the vegetables, potatoes, and mushrooms and piled them into the dutch oven. I decided that it would be best if the carrots and potatoes that take the longest to cook went in the bottom of the pan where it would heat up the fastest. Who knows if it makes a difference or not. The chicken breast went in whole, piled on top of some vegetables. I don’t like cutting up raw meat if I can help it, without running water it is a challenge to clean up the slimy mess afterwards. We added water to cover everything and keep it moist and tender. The spices thrown in were garlic, basil, salt and rosemary; an excellent aroma to fill the house. 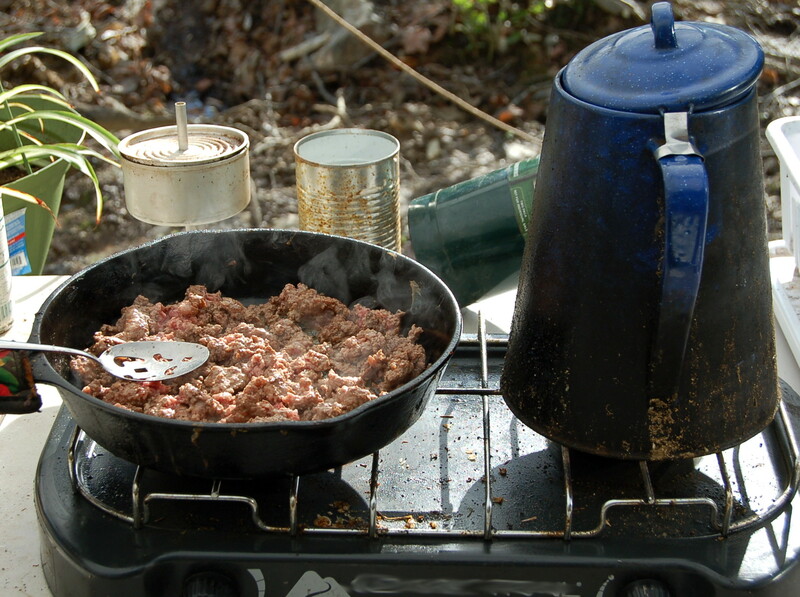 Put the lid on the dutch oven and bring the water to a boil. Once at a boil, we let it cook for about an hour. I’m not positive on the time frame, I was more interested in when the chicken was cooked and tender enough to break apart with a spoon. I also taste tested a carrot to be sure it was soft enough. Then we scooped the soup out of the dutch oven and filled our bowls right to the top. We were surprised at how long the soup stayed hot after we poured it into bowls. Don’t burn your mouth! Without running water, baths are a little more of a project. Not really all that bad though, now that we have got the hang of it. You just have to start collecting the day before. Yes. We are melting snow to take baths and showers. As long as we get as good start, we have no trouble getting plenty for all of us to get clean. It’s actually easier than buying the water and lugging up to the cabin. Although, it didn’t snow that much this year so we did have to buy some water. The snow is getting to be too muddy. This is our tub. Notice tje wood stove in tje background with the melting snow. A nice pile of firewood next to it. That 5 gallon bucket is the best part though. We have a camp shower with as submersible pump so we can take a shower. Fantastic upgrade we made. And ed reason the tub is not in the bathroom is because we have to carry it outside to dump it when we are done. Through a doorway would be too much. So there it is. Our shower. One of the issues we have here on the homestead is keeping food cold. We have a cooler that goes through tons of ice all summer. Then during the winter the food freezes. We plan to put in a root cellar this year for sure, but what if we could do better, passively? A fellow blogger is working on this very concept. I am very excited about this project and can’t wait to see what they do. If they succeed, it would mean so much to any of us living off grid. I don’t know all the details of the project, but it looks like they are trying to use the winter ice to cool a root cellar all summer. That would be amazing. If any of you out there are as excited about this as I am, check out the link to their project. They are currently trying to raise some money to get things going, but the link also explains the concept. If anyone would be willing to donate or to spread the word, it would be greatly appreciated. Just think about what this could mean for us off gridders! May not seem like much, but we have improved our shower. 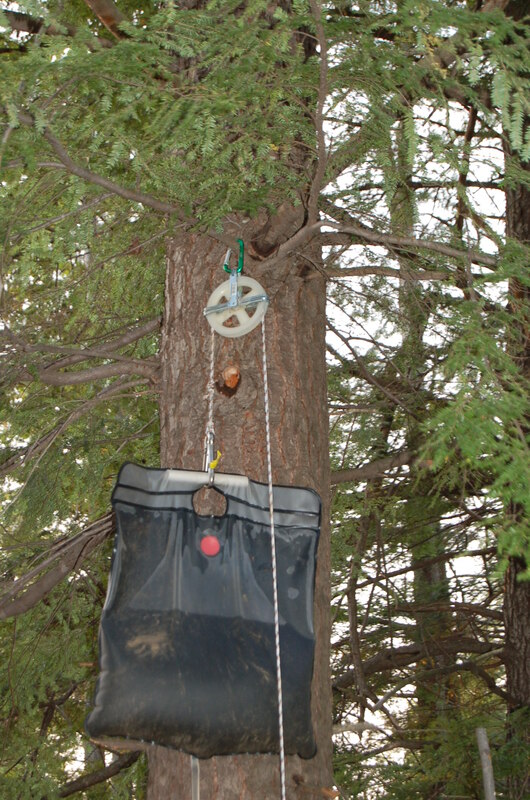 We now have the bag hanging on a pulley system so that we don’t have to climb the ladder every time we want to shower! This is a big deal. 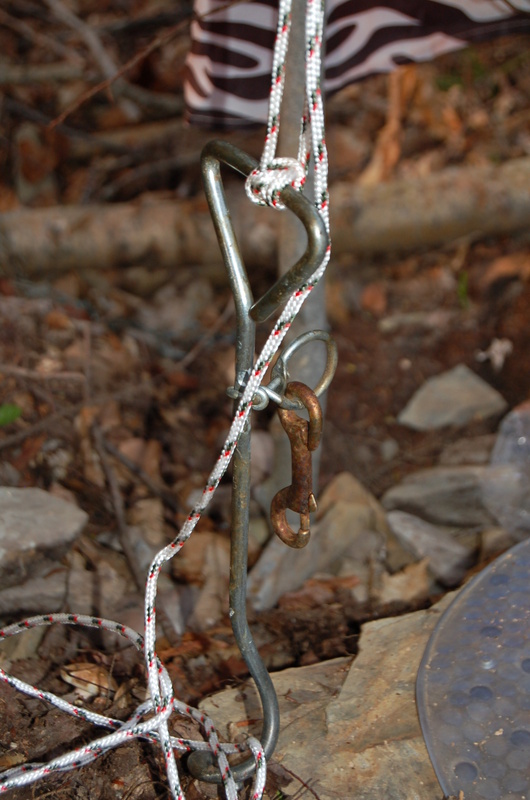 We put an old dog tie down in the ground to hook it to. Nothing fancy or exciting to anyone but us, but that is all I have for today. More building to come on Monday. This whole thing about having to work is messing up our building schedule. If I could just retire at age 33 then we could have our cabin done. Oh well. We never actually built an outdoor “kitchen.” Rather we have scattered cooking “appliances” for whatever we need to cook. What we use most is the small, two burner propane grill. We have this set up on our “kitchen table” under the awning from the tent. Most of our meals are super simple and don’t require much for cooking. 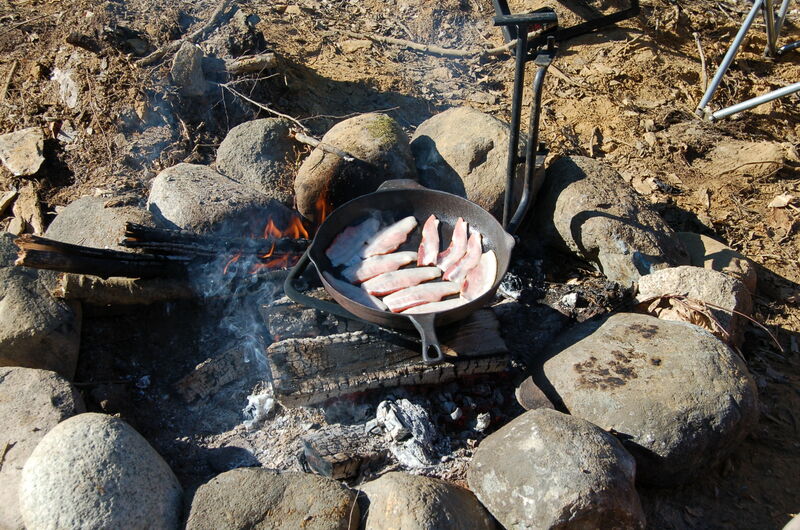 We use our cast iron fry pan almost always. We have an open fire pit that we can use a variety of “appliances” on. This cooker is great for the fry pans and the dutch oven, it flips over to accommodate either. I really like it because when we build our house, it came with special bolts so that we can build it right in to a large cooking hearth in the house. It can move between the house and outside. 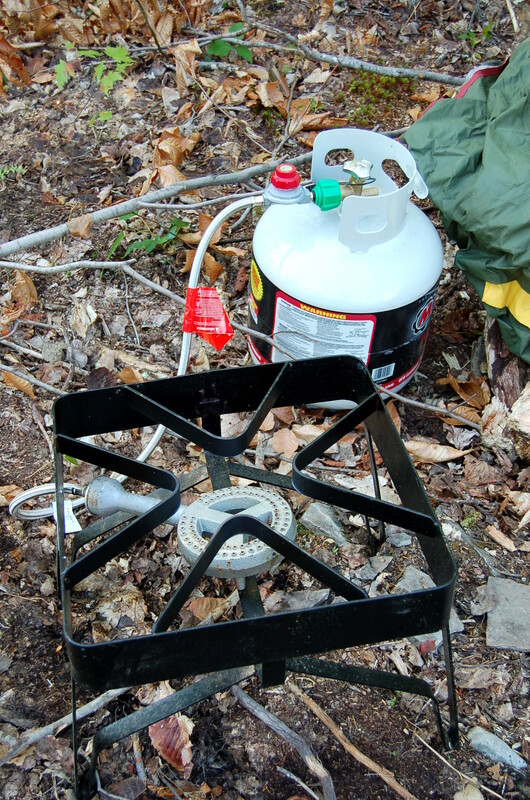 We have a large propane burner as well as the small one. It works great for boiling water. We have to boil a decent amount of water for washing dishes and for showering when it isn’t too sunny. This burner will get a lot of use when I get to start canning and when the man starts brewing again. 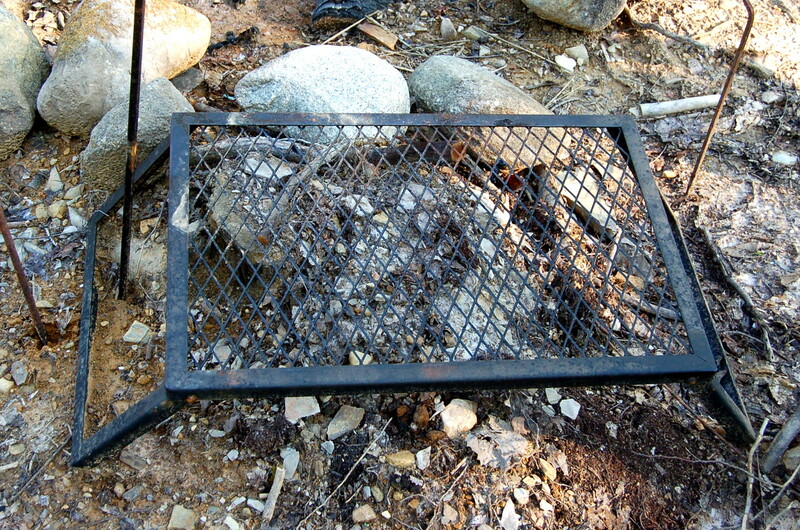 We also bought this grill grate to cook over the open fire. It works just fine, but we get more use out of it as a table. I have not yet been able to build the cob oven or rocket stove burners. They need a lot of time to dry and we have had tons of rain. I think we would be living in our tiny house by now if it had only rained half as much as it has. I started the cob oven a month ago and it hasn’t dried at all. I need to build a proper roof over the area where I am building it before I can even start to build it. When I have time. I still plan to build the outdoor kitchen I had planned, but not yet. Once the house goes up and we have a chance to spend time in the area, them I will know where the perfect spot for the kitchen and then I will start to build it.